As a Mac user, I've felt like a pariah over the past years that I've also been using Android as my go-to mobile platform. 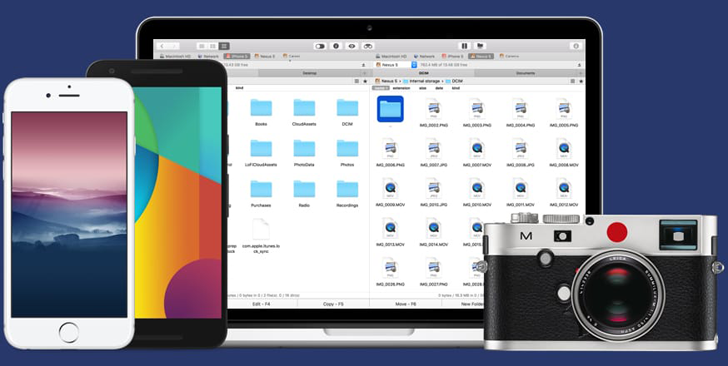 Mac works fantastically with iOS, but Android doesn't have any powerful integration with any desktop environment. That's been the status-quo of things for as long as I remember. Android does work well enough with Windows when you're just trying to transfer some files though. 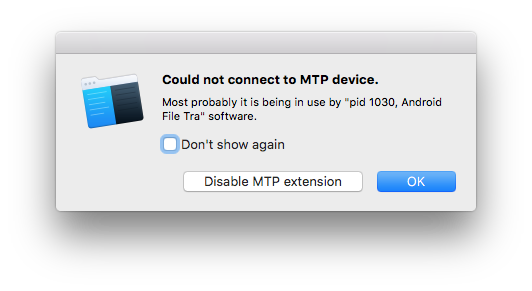 But if you're on a Mac, simply plugging in the phone with a USB cable and choosing the MTP mode (File Transfer) wouldn't do the trick, you'd need a separate app called Android File Transfer (ATP) from Google to make it work. And this is where things would go either averagely well either terribly wrong. Two of many error messages you may see with Android File Transfer. 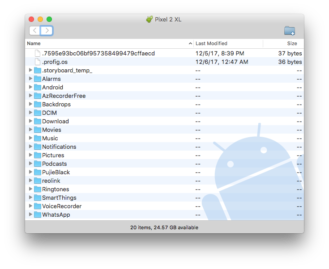 Android File Transfer users can easily list a series of issues with the app. Sometimes it disconnects for no reason, sometimes it fails to see the device, and don't quote me on this but I think it hasn't been updated for many years now. At least it still looks and works now like it did the first time I tried it. It's a pretty rudimentary utility with nothing but one window to browse the different folders on your phone. 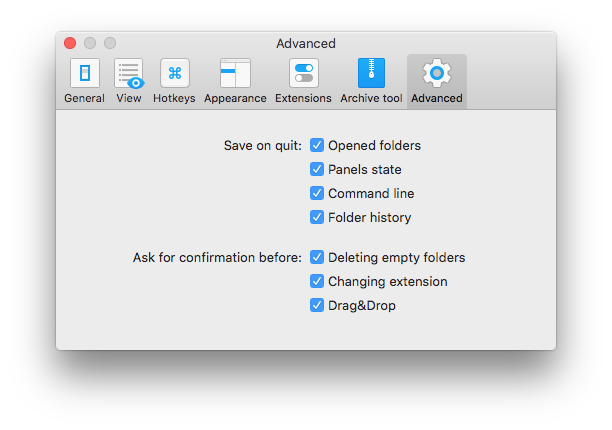 You can delete a file, create a new folder, and select files to drag-and-drop between it and Mac's Finder. And that's pretty much it. 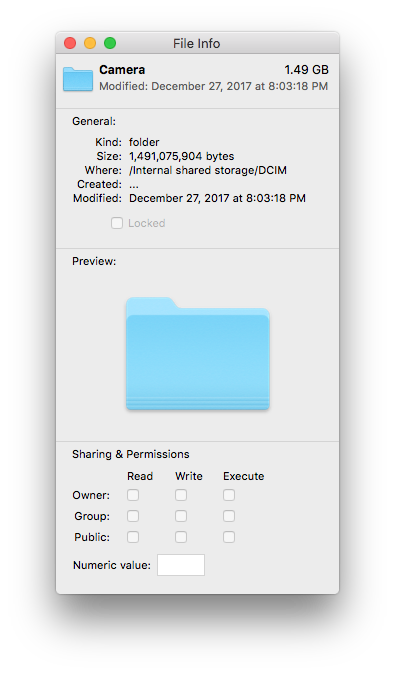 You can't open a file before you drag it to your Mac, you can't browse multiple folders at once, you can't search, and so on. It's just a transfer utility, not a file browser, and that explains why every action you expect to be able to do on a file is missing in it. Sorry, no file opening for you! Enter Commander One from Eltima. To be honest with you, I had heard of Eltima's solutions before, starting with SyncMate, but I'd never given them a proper go. I use very little third-party software on my Mac beyond Chrome and Photoshop and I find Mac software way overpriced. 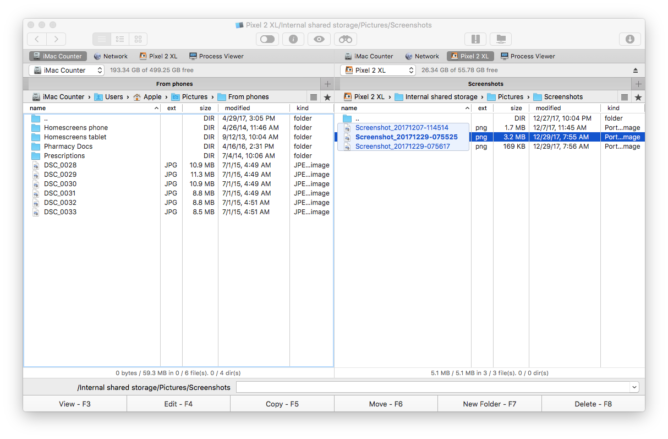 So when Eltima reached out and asked us to take a look at Commander One's Android file manager and transfer abilities, I was intrigued though not fully convinced. After giving it a go, I'd say it does what it promises, but I'm still not sure that's worth the entry price unless you need its other abilities or you copy large files super frequently between your phone and computer. So before I get into what Commander One does and how it works, let's clear out the pricing and versions issue. 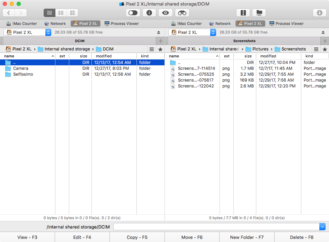 Commander One is a free file browser, but the PRO pack opens up a lot of features including Android and MTP support (free vs PRO comparison chart). It's free to try for 15 days, after which you'll need to pay to unlock those added options. 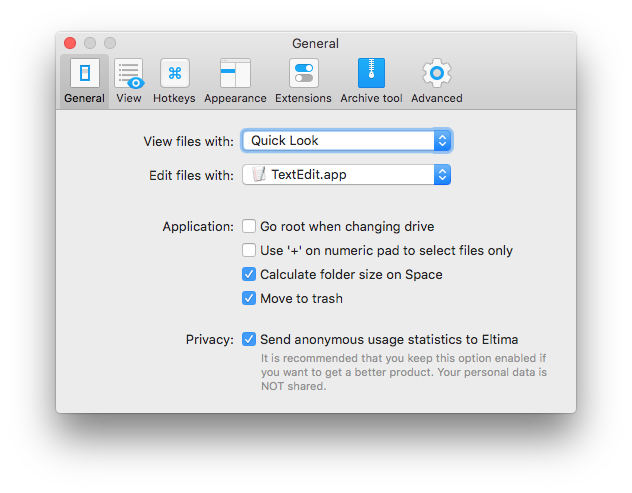 Now there are two ways to purchase the PRO pack, either from the Mac App Store or from the Eltima store, and it costs $29.99 regardless though there are benefits and downsides to both so check this PRO source comparison before you decide where you want to plunk down your dineros. With that out of the way, let's check out what Commander One does exactly. It's a dual-pane file browser by design, though you can add more tabs to the setup. 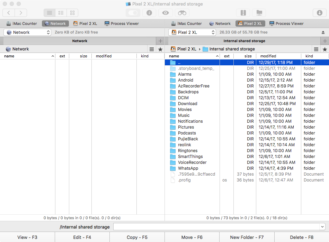 It's also built around expandability and integrations so it can connect to FTP servers, cloud services, iOS and Android devices, and it even has some added options like a terminal emulator and root access. 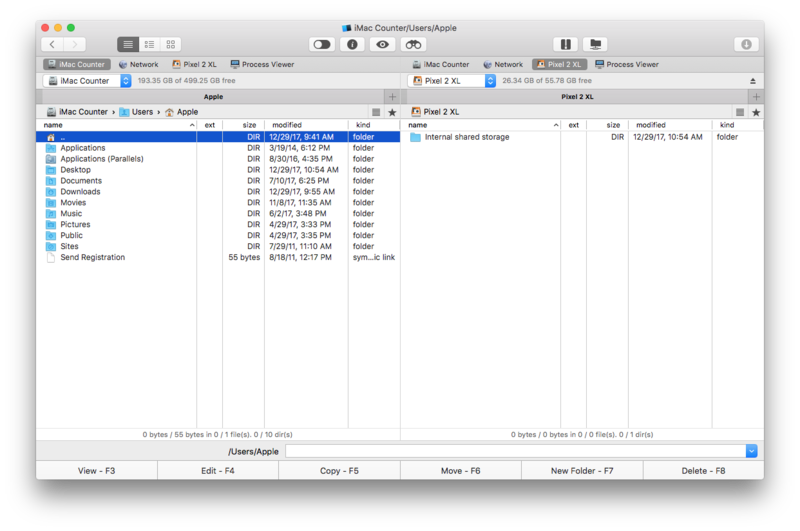 I have been using the Column view in Finder for 10+ years, so Commander One doesn't really work well for me as a day-to-day browser, but aside from that, I found that the interface is usable for everything else I need Finder for. The keyboard shortcuts are a little different, but I could get used to them. The onboarding screen when Commander One launches explains the interface. 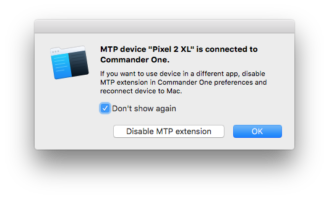 After you've installed Commander One, you can go ahead and connect your Android phone over a USB cable and put it in MTP / File Transfer mode. You'll see one of two pop-ups from Commander One. The first tells you that the app can handle MTP connections and gives you the option to disable that extension if you don't need it, which would be counter-productive here, and the second might show up if you already have Android File Transfer installed and it warns you that it can't read your phone because AFT is already doing so. 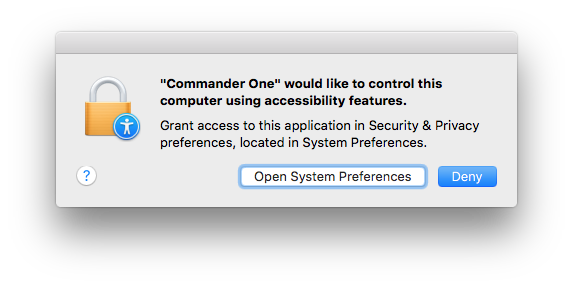 The third, and frankly the most annoying pop-up I got from Commander One, is a nagging request to give it Accessibility access. The team explains why these are needed here, but if I'm not going to use these options, I would have liked a way to deny access and not be asked about it again until I tried to do something that requires accessibility. As it is, Commander One kept nagging me until I gave in and granted it access. When you're done with the dialogs, Commander One sees your phone, in this case my Pixel 2 XL, and lets you start browsing it just like you would any directory. Browsing the Pixel 2 XL on Commander One. 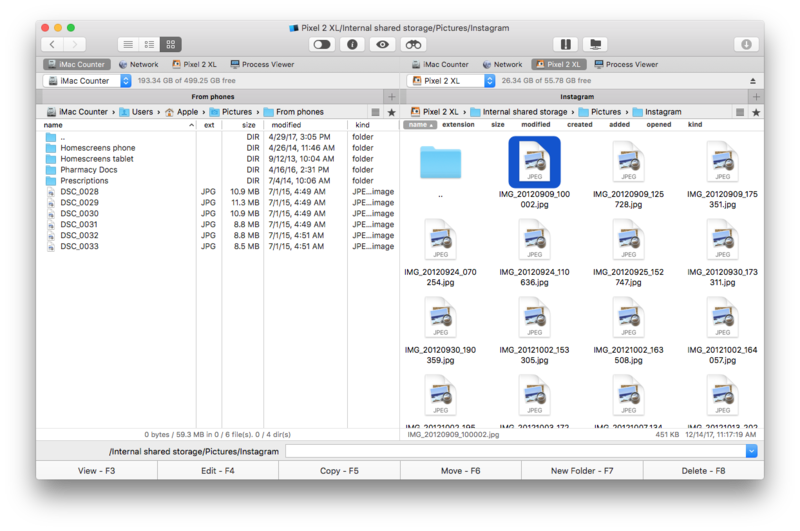 Viewing the folders and files is pretty straightforward and so is navigating down and up in a folder structure. You can choose two different view styles for each pane, so you can keep the list in one and go with thumbnails in the other. 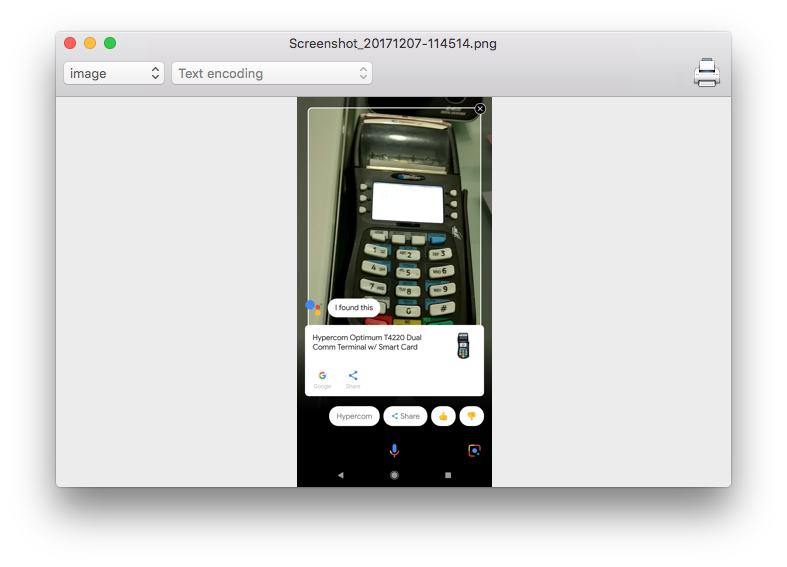 However, it's sad that both thumbnails and previews don't work with MTP devices so all you get are generic .png icons as thumbs instead of a mini preview of the image itself. List view vs thumbnail view. 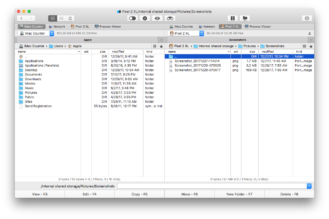 We're already a few steps ahead of Android File Transfer just with this view. 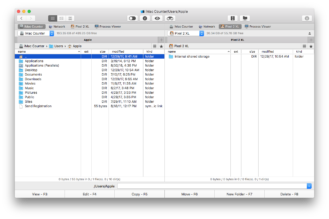 AFT only gives you the last modified time and size attributes of a file, whereas Commander One can show the file extension, size, kind, date created, added, modified, opened, and even its permissions. Other benefits to Commander One are that you can add tabs to one of the panes or even open your phone in both so you can drag and drop between two folders on your phone, which you can't do with AFT. 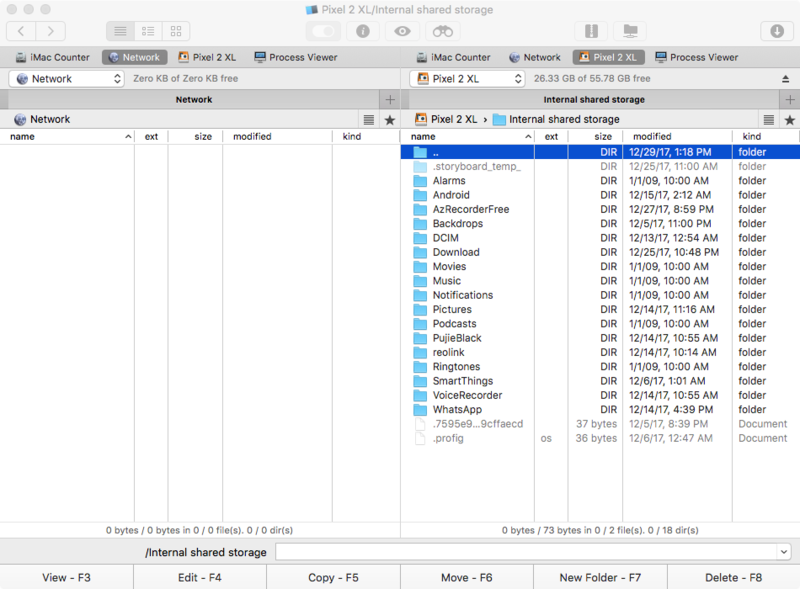 It also has a toggle to hide or show hidden files, whereas AFT displays them as regular items without the distinction. Different Pixel 2 XL folders on both panes (left) and view hidden files and folders (right). There's also a history for each pane so you can easily go back to a folder you were on before without manually navigating back to it. File and folder actions are also way more advanced in Commander One. Beyond delete and drag-and-drop, you can rename items, see their info, open them (either in Commander One's viewer or in Preview), use Quick Look to have a glance at them, compress them, duplicate, and copy/paste. 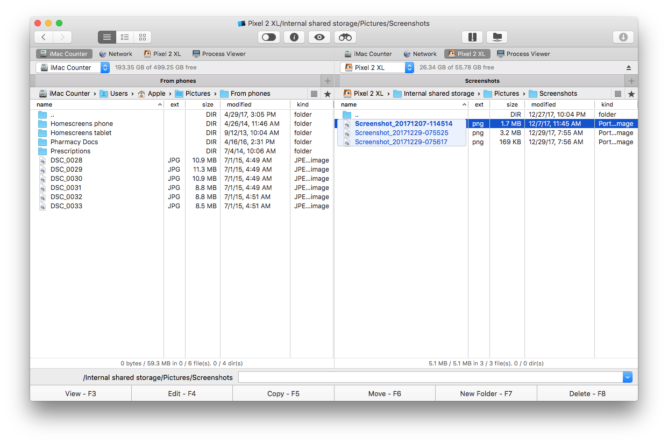 ... and the option to view an image stored on your phone without having to copy it first to your Mac. 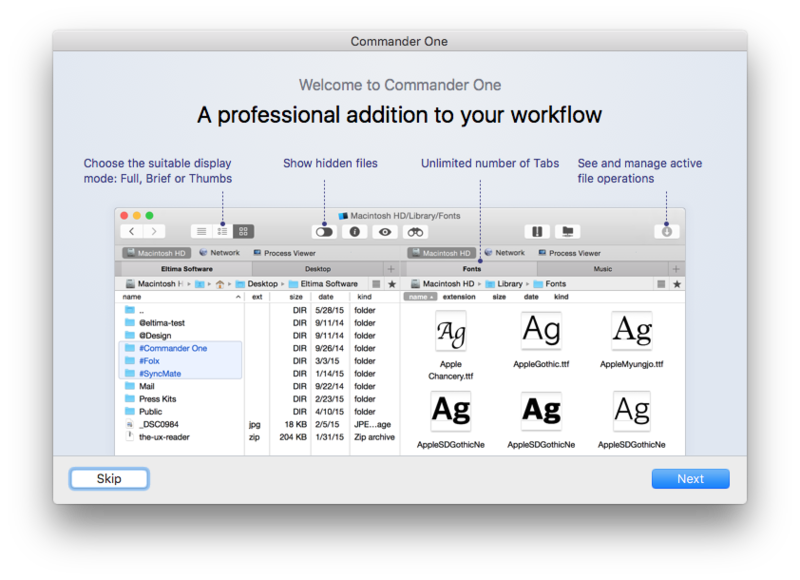 Selecting items in Commander One is the same as in Finder and you can easily use keyboard shortcuts to cut or copy and paste them anywhere or drag-and-drop between the two panes. I found it super fast at copying several types and sizes of files between my old iMac and Pixel 2 XL. It's definitely faster than Bluetooth and WiFi combined. 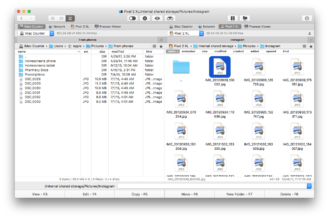 If you look closely, you'll see it gives you the total number and size of the selected files. One of the little bonuses I discovered was that by tapping + after I selected something, I could get an Expand selections menu that let me select all items of a certain type in the current folder. That's quite nifty. And it works with - (minus) as well for shrinking the selection. 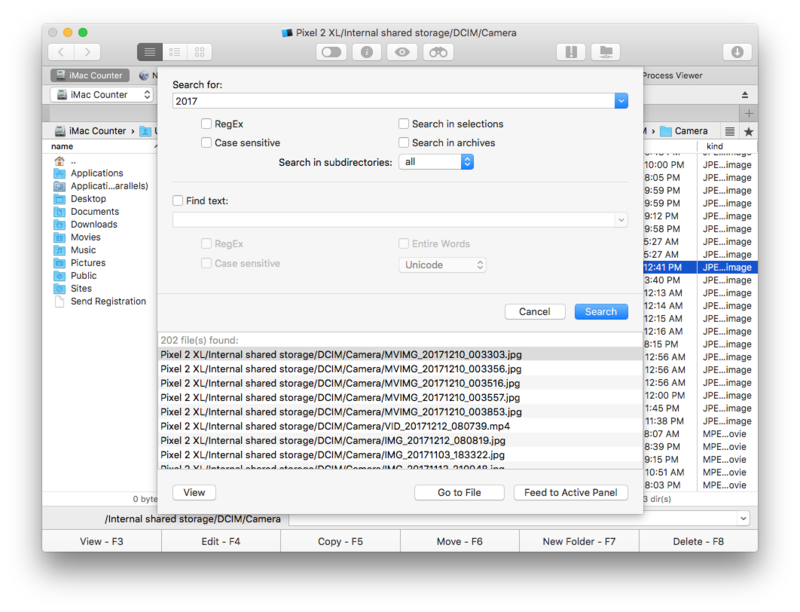 Dragging items also pops up a little window that makes sure you want to copy files over to this exact location. 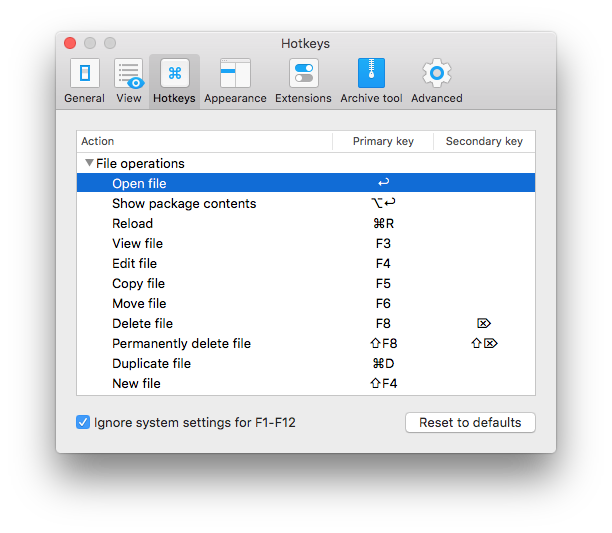 It can get tiring sometimes, but you can disable it in the preferences. The only annoyance I found was with deselecting items. 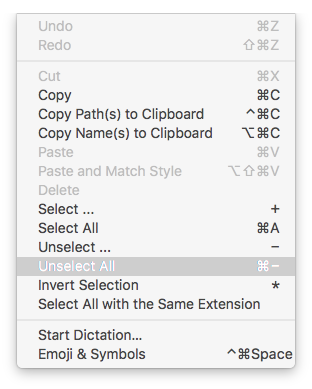 Unlike what you may think, clicking on something else won't deselect what you've previously highlighted, but you'll need to use a keyboard shortcut to do it. It's quite counter-intuitive and unlike any browser I've ever used. And finally, Commander One also has an elaborate search function that can look for specific keywords in selections or entire directories. There are several more functions to Commander One in the menus. 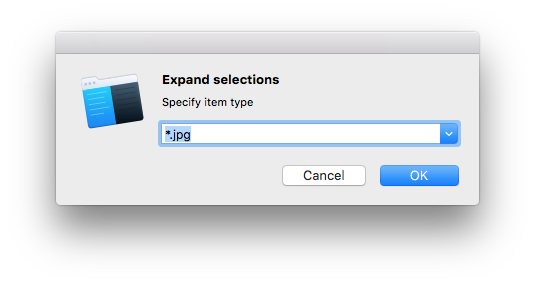 One of them is the Unselect All that I just talked about, or the option to copy file names or paths, or even to invert your selection. 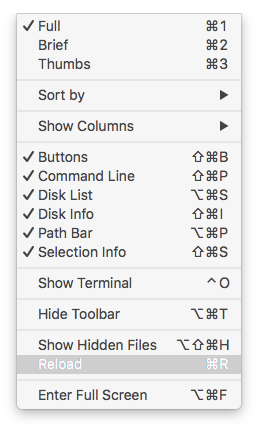 There are also viewing choices to show or hide the buttons, path bar, selection info, terminal, command line, hidden files, and more. Edit menu and View menu. 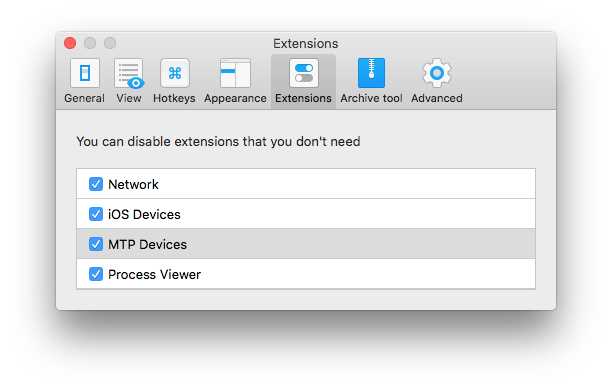 ... which extensions are enabled, such as the MTP one that's essential for browsing Android devices, and what to save when quitting and when to pop a confirmation dialog. 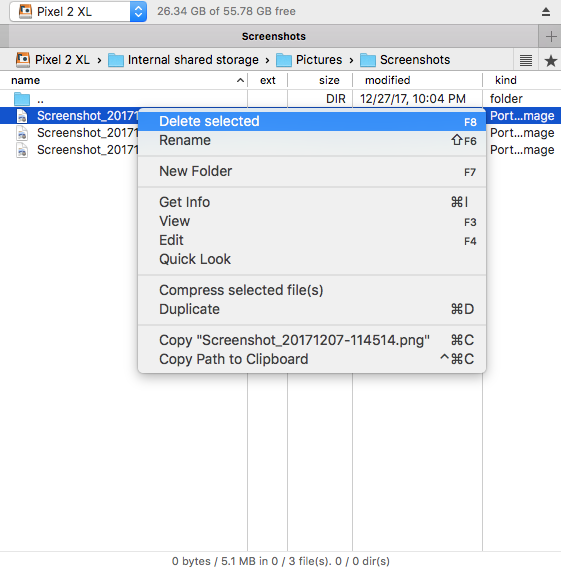 As is clear from the rundown, Commander One gives you complete browsing and editing capabilities on your Android phone's storage, as if it was a folder on your computer. From search to conditional selection to the ability to open a file without transferring it first to all the various views and options, there's really no fair way to compare it against the barebones drag/delete functionality of Android File Transfer. But there are still a few hiccups worth thinking about. First is that try as I might, I don't think Commander One can open automatically when you connect your phone over MTP, unlike Android File Transfer. It's a minor inconvenience, but you'll have to launch it manually. Second is that your phone might not be properly detected, it's infrequent but it happened once or twice, or it may not show up if you close Commander One and reopen it. Switching my Pixel 2 XL to charging then back to MTP fixed that, and I've found Commander One to be more reliable than AFT but still, I wouldn't say this solves all of AFT's connectivity problems. Some of this might be due to MTP peculiarities so check these conditions out before you blame either Commander One or AFT. 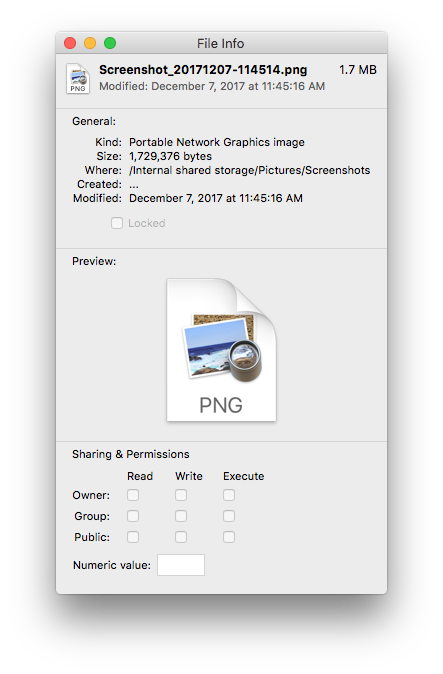 Aside from that, the two main things I didn't like about Commander One were its inability to preview / show thumbnails of files on my phone and the quirky deselection method. 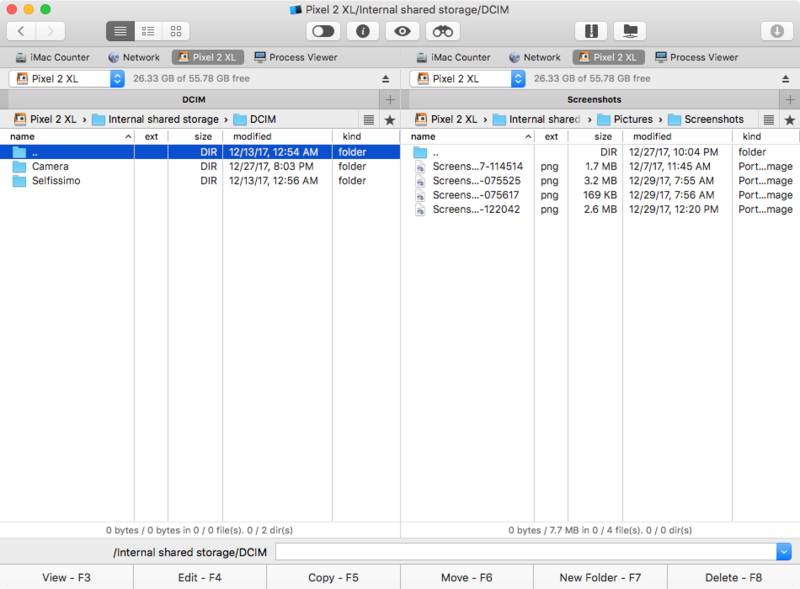 If you were already in the market for a powerful dual-pane file browser on Mac and Commander One hits the sweet spot for you while also providing compatibility with your Android phone, then it's easy to say that the $29.99 price tag will be worth it for you.